Four New Images to celebrate Nigel Hemming 40yrs as a professional artist. 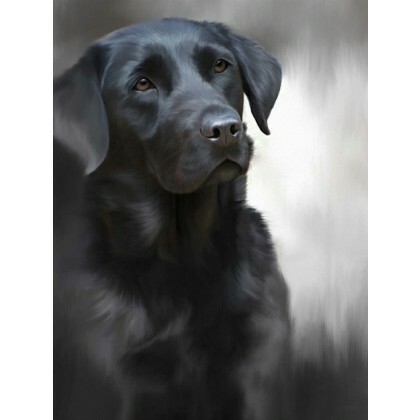 This stunning Black Labrador is a Limited Edition Giclee Print of just 40 copies signed and numbered by the artist. The print is 16.5”wide x 22”high. In 1977, Nigel Hemming abandoned his three year Bachelor of Education degree to try painting for a living. He had no idea if he would succeed, but felt compelled to at least try. Forty years on and he’s still here. His stunning dog images clearly show why. Nigel felt it appropriate to mark this 40th anniversary with four new images of breeds that are probably the most representational of his career and have become synonymous with his work as an artist. Labs, Springers and Collies are working breeds that have been so important. The Westie is a breed that Nigel came to know and love through a most wonderful, sixteen year relationship with one in particular. A little lad named Berkley Bear. Nigel has had the pleasure to paint many wonderful animals over the last four decades, all of which have given him tremendous fulfilment and he is humbled that his work has been as popular and successful as it has. To those who have supported him and enjoyed his work, Nigel thanks you and hopes you may continue to do so.